This week be ready for Jacksonville’s best golf tournament of the year. THE PLAYERS Championship will be held from Tuesday March 12th-17th. This weeks schedule is listed below. · Entrances open at 7:30 a.m.
· Military Appreciation Ceremony and Jon Pardi Concert on Hole 17 at 5:30 p.m.
· Entrances open at 7:00 a.m. This weekend, Jacksonville will hold its largest 15K race in the United States. The GATE River Run serves as the USA 15K Championship with America’s top Olympic athletes competing for $85,000 in prize money. Last year over 20,000 runners and walkers participated in one of our featured events including the 15K, The Florida Times-Union 5K for Charity, the Junior River Run, and the Brooks Rehabilitation Challenge Mile. This Thursday and Friday, Jacksonville Area (Duval, Clay, St. John’s and Nassau counties) participants must pick up their packets at the Runner’s Expo located at the Jacksonville Fairgrounds. Runners will also have a chance to purchase any last minute accessories for the upcoming race. With TPC coming up this month, The Players Donna 5K will be happening this weekend. Presented by Nimnicht Family of Dealerships, The Players Donna 5K is an event to raise funds to finish breast cancer! On Saturday, March 2, 2019, runners and walkers of all levels to experience a last chance, behind-the-scenes 5K route through the beautiful PLAYERS Stadium Course at TPC Sawgrass. With a new 2019 course, participants will begin from the new Sawgrass Square near the beautiful TPC Sawgrass Clubhouse, and continue along the cart paths through all back nine holes, passing the world famous island green at 17 as the final preparations for THE PLAYERS Championship are being made. Registration is open and all runners will receive a pre and post race Top Golf Tee Party with music, food and beverage. All finishers will receive a commemorative medal and one Free stadium pass to the Players Championship Wedensday, March 13. Race is limited to 1750 participants, this race will sell out!!! This Saturday, running and girl scout cookies come together for the Thin Mint Sprint 5K. This event will have cookie booths for you to get all the cookies for this season, as well as enjoying free music, food, smoothies provided by Smoothie King and much more. This race is part of the Sweet 3 Raceries. All 5K participants will receive a T-shirt and medal, and 1-mile runners receive a medal. Registered Girl Scout participants will also receive an exclusive patch to commemorate the race! Register online through February 22, 2019 Late registration is available on race day from 6:30 - 7:30 a.m.
Race day packet pickup will be available at the race location 6:30 - 7:30 a.m.
It’s back for Valentine’s Day weekend!!! Cupid’s Undie Run, the nations largest underwear run and charity event will be held in Jacksonville for a third year on February 16th at Kickback’s Gastropub. This 1 mile fun run is a race to find a cure to neurofibromatosis, a genetic disorder that affects 1 in every 3000 children born. They encourage undies, but some understand that it’s not for everyone. For those who don’t want to show off their underwear, you can wear costumes to show off your style. Participants can start a team with their friends, join a team or run solo, everyone can come out and have a blast, and raise some money for NF research. Doors open at noon, 1 mile fun run begins at 2pm and post party goes on til 4pm. Drink specials, music, friends and philanthropy…..what more could you ask for? Live entertainment will include a performance by Aaron Thomas & Soulo Lyon of The Band Be Easy. Additionally, guest can enjoy food and drink specials, a giveaway for a $100 Cowford Chophouse Gift Card, and a complimentary cocktail. Join us at Jacksonville’s new rooftop bar for the Downtown Wine Down, a monthly happy hour and cocktail mixer held at Cowford Chophouse. July's Downtown Wine Down will be a ticketed event to ensure there are no long lines and that we can contain capacity. Live entertainment will include a performance by Aaron Thomas & Soulo Lyon of The Band Be Easy. Additionally, guest can enjoy food and drink specials, a giveaway for a $100 Cowford Chophouse Gift Card, and a complimentary glass of sangria! Join us at Jacksonville’s rooftop bar for the Downtown Wine Down, a monthly happy hour and cocktail mixer held at Cowford Chophouse. Live entertainment will include a performance by The Chris Thomas Band! Additionally, guest can enjoy food and drink specials, a giveaway for a $100 Cowford Chophouse Gift Card, and a complimentary holiday inspired cocktail! The roof will be open to ticket holders at 3:30pm and be closed to anyone without tickets the remainder of the night until 9:30pm. The St. Augustine Amphitheatre is ready and the first concert of 2019 to held this weekend is Alabama. Alabama changed everything for country music. Since 1980, Alabama has delivered hit after hit, starting with their first Top 20 hit “My Home’s In Alabama.” Since then, Alabama brought country music to the mainstream and from side stage to the main stage by introducing rock style guitars, lights, pyrotechnics and sounds to the country audience. Join us this Saturday at the 4th Annual #DTJax Gala: Havana Nights, Neon Lights. Come out and raise funds for the Lively and Beautiful Sidewalks initiative. Last year they raised over $40,000 with the help of their sponsors. Be sure to indulge in delicious food from Bellwether, Cowford Chophouse and Bread and Board, plus an open bar with selections from Bold City Brewery, Intuition Ale Works and Manifest Distilling. You will also enjoy dance performances and salsa lessons, a cigar rolling station, the Tin Can Photo Lounge, silent and 50/50 artist split auctions, themed giveaways, complimentary valet and more. All of this while you help us recognize the #DTJax Award Winners and raise money for placemaking in Downtown Jacksonville through the LABS Initiative. Calling all fans of the Bachelor!!! Accept a rose and join us this Monday, February 4th for our exclusive Bachelor watch party! The party will take place in the Brew House at River City Brewing Company and the first 100 ladies will receive a rose. This event will be held every Monday for this season. The Bachelor has been a long running show on ABC for 23 seasons. This season’s Bachelor is Colton Underwood, a former NFL player with his good looks, love for dogs and his vulnerability. After being seen on The Bachelorette with Becca Kurfin, Colton will have a chance for a shot at love this season. Tickets include drink & food specials, a raffle ticket for your chance to win over $500 in prizes, + more! The event runs from 7:00pm-9:30pm & the show airs at 8:00pm! The Venardos Circus is returning to the Saint Augustine Amphitheatre! Join them Dec 19th - Jan 27th, and experience the magic of the circus in their custom red-and-white circus tent at the Saint Augustine Amphitheatre, 1340C A1A S, St Augustine, FL 32080. This is the FB Event for the DEC 2018 dates. See their FB Event listings for their Jan 2019 dates here: https://bit.ly/2y0TcZR This unique, family-oriented traveling circus troupe has been touring the country for four years and was recently featured on CBS Sunday Morning! 🎩Created by former Ringling Bros. Ringmaster Kevin Venardos, the show features a cast of aerialists, acrobats, comedians, juggling, balancing, daredevilry and performers hailing from around the world. The Broadway-style singing and dancing add another level of intrigue to the performance. An interactive pre-show party takes place one hour before show time with opportunities to meet the cast, snap selfies and play games so be sure to come and get your seats early! Don’t miss Jacksonville’s Largest St. Patrick’s Day Event held at the Riverside Arts Market on the St. Johns River in Riverside. This event will include live music and free concerts all day, 15 food trucks, vendors and makers, a kid zone, games, crafts, street performers, and more. Partial proceeds from the event will benefit numerous charitable organizations including Vets on Tap, Fur Sisters, and the Jacksonville Jaycees. Complimentary tickets include a commemorative wristband & $1 off all beers all day at the festival. VIP passes include Complimentary Beer & Water All Day, Access to VIP seating & viewing area, & 10% discount at all food trucks. This Wedensday, bring your noise makers and meet at the intersection of Independent St. and Laura St. at 5:45 p.m. for a Mardi Gras-inspired procession to the Main Stage in Hemming Park, led by Spice and the Po Boys. Headquarters In Hemming Park - Stop by the Main Stage and enjoy live music by Spice and the Po Boys from 6-8 p.m.
Browse artwork by ABDUL, Artzy Fartzy Petz, The Bead Bowl, Kram Kan Photo, Moonchild Studio, Jumping Jackalopes,Tovah2Creations, Sand Art by Ala, Pranasolcreations, The Turtle Guy and Viktor Lazarev. And don’t miss these vendors and non-profit organizations: AT&T, Neglected Vision, First Coast Rotary, JAX Pack and No More Homeless Pets. Kid Zone on Laura Street - Bring the kids to enjoy a magic show by Cross Roads Magic, activities by My Gym, jump-roping by Jump 4 Jax and face-painting by JMarie Art and Life. Vagabond Flea @ Hogan St. - Check out this creatively curated market that features local artists, quality makers, upcyclers, vintage and antique sellers, and more on Hogan Street, south of Hemming Park. Feel like retail shops are a little expensive right now? Well, come out this weekend to the Junior League’s 28th Annual Whale of a Sale at the Jacksonville Fairgrounds. Browse through gently used furniture, clothes, home goods, tailgating gear and much more. All proceeds from Whale of a Sale benefit the Junior League of Jacksonville’s community projects with a focus on nutrition education and fresh food availability across our area and for member training. Tickets are on sale now for the preview party March 1. Come out for some live entertainment, food, silent auction and the best deals in town. For more info about the preview party click here. This Saturday, bring all of your friends out to the 6th Annual Riverside Craft Beer Festival. Taste over a hundred craft beers from different breweries all over Florida. Food will be provided by the local food trucks from the Jacksonville area. Live music from The Road Band will entertain the crowd. All festival proceeds will benefit the children and their families at Community Hospice and Palliative Care. Mark your calendars for Jacksonville Magazine's second annual Jacksonville Lantern Parade presented by VyStar Credit Union, an illuminated celebration of creativity, art, children and the St. Johns River. The event will take place the evening of February 16, 2019. The planned parade route will stretch along the Northbank Riverwalk, extending from the Fuller-Warren Bridge to the Jacksonville Landing. Food and fun begins at 6 PM with the actual parade beginning at 7 PM. Fireworks will take place at the Jacksonville Landing at 9 PM. The glowing display of color will literally shine a light on the heart of Jacksonville and everyone is invited! Participation is free to the public. All we ask is that each participant carry something that GLOWS, TWINKLES, or SHINES. Bring either a homemade creation or a store bought item, we don't mind so long as you participate in the grand illumination. In addition, The Lantern Parade will serve as a fundraiser, a benefit with the goal of raising money to purchase needed art supplies for area schools. The “road diet” includes slimmer traffic lanes in exchange for protected bike paths, off-street parking, wider sidewalks, built-in bus stops and upgraded landscaping. The Downtown Development Review Board (DDRB) application said the project focuses on “reduced travel lanes, traffic calming, and enhanced landscaping” to make the area safer for Southbank residents. In addition to existing condo and apartment towers, more housing is in development for the area, including Catalyst Development Partners’ proposed San Marco Apartments at 1444 Home St. and the 263-unit riverfront Broadstone River House under construction. iFLY, a company who operates indoor skydiving facilities, is looking at the possibility of opening one of them in our area near the Town Center off I-295. iFLY is the experiential entertainment company that created modern indoor skydiving. They make the dream of flight a reality by giving their customers “wings” in a safe and reliable environment. iFLY started in 1998 as SkyVenture, LLC. Once they had developed the technology to create a stable, wall-to-wall cushion of air in a flight chamber, they knew they could offer an incredibly realistic and safe indoor skydiving experience. They opened their first indoor skydiving facility in 1999. Between 1999 and 2005, they opened three more facilities. In 2005, they rebranded themselves iFLY, maintaining SkyVenture as their design and manufacturing company. Fill out the quick survey below for your chance to win 2 FREE VIP TICKETS to an upcoming Gameday Tailgate Experience party this upcoming Jags season! This one-of-a-kind event includes a 4 hour tailgate celebration featuring an open bar, all-you-can-eat food, former athletes/celebrity hosts, a VIP lounge area, live entertainment, exclusive interactive games, & more! 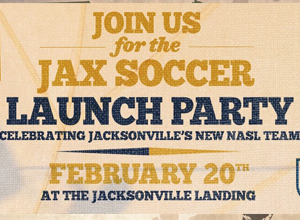 Kick off the start of Jacksonville's new professional soccer team! Come join us for an evening of fun and celebration. The party will be held at the Jacksonville Landing, Thursday February 20, from 5:00-8:00pm. - Great selection of food and beverage - Soccer style games and experience - Merchandise Tents - Live Music - Q&A session with Club Executives - Special Fan Entertainment And more! 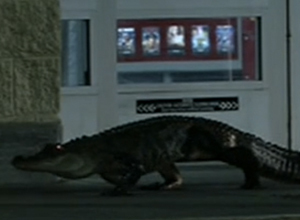 Apopka, Fl - A 6 ft alligator hung out at the entrance of a Florida Wal-Mart Superstore Monday Night. The gator (pictured below) wasn't afraid of shoppers and hung out in front of the moving doors for about a hour. The doors even opened multiple times for the creature but the gator remained outside. Police were dispatched to the scene and barricaded the area. Shortly after, the gator quietly crawled off into the brush nearby. Shoppers claim they have seen the 6ft gator in the retention pond next to the store before.